Here’s a beautiful image from Ike’s Art today in combination with some gorgeous spring papers from Paper Temptress. I love this combo with the copic marker colors on the flowers it goes perfectly. 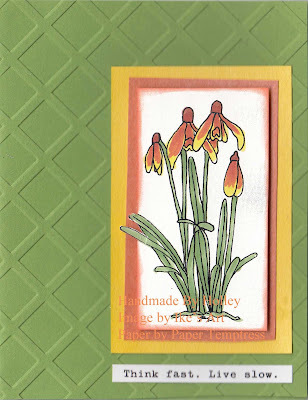 The image is called Snowdrops and is just $1 on the Ike’s Art site! WOW. It very much reminds me of a Texas wildflower we have here that I believe is called Mexican hats (see here). I am using wonderful Paper Temptress papers for this project. The image was printed out onto Heavenly White paper. The project was layered on Mica Flame and Astrobright Solar Yellow, The card base is pop tones Gumdrop Green.